Orri Vigfússon (d. 2017) brokered huge international fishing rights buyouts with governments and corporations in the North Atlantic, effectively stopping destructive commercial salmon fishing in the region. Throughout the latter part of the 20th century, the once-plentiful wild salmon populations in the chilly waters of the North Atlantic dwindled to dangerously low levels, affecting not only the sensitive ocean and river ecosystems of the region, but also the rural communities for whom salmon fishing is a long-held local tradition and source of income. In the early 1990s, Orri Vigfússon started an innovative, multinational initiative to buy out the fishing rights of commercial salmon fishers whose over-fishing was causing the decline. He represents a new breed of environmental leader who utilizes business skills and negotiating to effectively protect precious natural resources. Through his work, Vigfússon succeeded in preventing the seemingly inevitable decimation of wild North Atlantic salmon populations. An entrepreneur and life-long outdoorsman, Vigfússon first became aware of declining salmon stocks in the 1970s while fishing along the rivers of his native northern Iceland. Speaking with others who lived or fished along local rivers, he learned the extent of Iceland’s shrinking river salmon populations. In response, Vigfússon founded the Iceland-based North Atlantic Salmon Fund (NASF). Since 1989, the organization has raised more than US$35 million to buy the netting rights from commercial fishers across the North Atlantic, essentially paying commercial fishermen not to fish salmon in the North Atlantic. NASF has also brokered moratorium agreements with several national governments. These efforts have dramatically improved salmon fish stocks in numerous countries. According to NASF estimates, commercial open-sea fishing in the Atlantic has dropped by more than 75 percent in the last 15 years, and river anglers in several countries in areas where nets have been closed have reported substantial increases in salmon catches. In 2007, NASF estimated that more than five million North Atlantic salmon had been saved to date. In order for the buyout system to be successful, Vigfússon had to succeed on a number of fronts. He had to raise millions of dollars to compensate the commercial fishermen for the loss of income they suffer in giving up salmon fishing. The agreements are designed to cover a fixed period of years but the hope is that by the time the agreements expire many of the fishermen will not wish to return to salmon fishing. A large percentage of NASF’s funds, therefore, is spent on assisting the fishers to find alternative employment. He also had to negotiate with individual governments in order to persuade them to provide matched funding and to change the policies and economic decisions that have previously influenced their fishing industry practices. To ensure the sustainability of these efforts, Vigfússon began promoting viable economic alternatives for salmon fishers including snow crab and lumpfish caviar harvesting. In the beginning, Vigfússon reached out to a variety of stakeholders across Iceland, Europe and North America to convince them of the need to address the over-fishing problem. He met with residents of river communities and local anglers, who were all experiencing declining numbers of river salmon. He began discussions with commercial salmon fishers, talking openly with them about the extent of the problem from both an environmental and economic point of view, including how their own livelihoods were being affected. After raising significant grassroots support, Vigfússon approached governments, introducing his idea of the buyout agreements. With a mind for business and a passion for his cause, Vigfússon brokered multi-million dollar buyouts or moratorium agreements with commercial salmon fishers in the Faroe Islands, Iceland, Wales, England, Greenland, France and Norway. Vigfússon and NASF´s branches in the UK and Northern Ireland brokered agreements to buy out the remaining drift nets in partnership with the authorities. In November 2006, after years of campaigning and negotiating by NASF, Ireland finally announced that it would buy out all of the country’s salmon drift-netting licenses. As part of the buyout, the Irish government will establish a hardship fund of more than US$39 million to address the financial losses that Irish salmon fishers will face, as well as providing an additional US$7 million fund to help rural communities deal with the loss of income. This development represents one of the final steps in Vigfússon’s vision of securing a complete halt to salmon fishing at sea in the North Atlantic. Vigfússon is focused on the remaining interceptory coastal nets in Scotland and Norway, the last countries to operate major mixed-stock fisheries that prevent many returning salmon from reaching their native rivers. The governments in both countries have been slow to act and are reluctant to work with civil society groups such as NASF. As a result, both countries face significant negative impacts to the salmon stocks on their local rivers. Support the NASF and make a donation. Orri Vigfusson, receiving his award at the 2007 Goldman Prize ceremony. 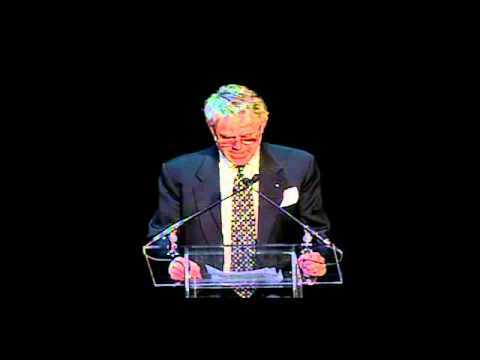 Orri Vigfusson, accepting his award at the 2007 Goldman Prize ceremony. Orri Vigfusson, 2007 Goldman Environmental Prize Recipient for Islands & Island Nations (Iceland). Orri Vigfusson, 2007 Goldman Environmental Prize Recipient for Islands & Island Nations (Iceland), with Ouroboros statue.